News Release, Office of Governor Edmund G. Brown, Jr.
SACRAMENTO – Reaffirming California’s global climate leadership, Governor Edmund G. Brown Jr. today signed Senate Bill 100, authored by Senate President pro Tempore Emeritus Kevin de León, setting a 100 percent clean electricity goal for the state, and issued an executive order establishing a new target to achieve carbon neutrality – both by 2045. “This bill and the executive order put California on a path to meet the goals of Paris and beyond. It will not be easy. It will not be immediate. 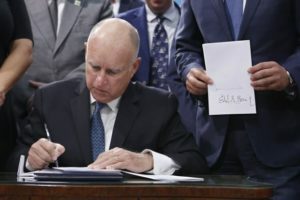 But it must be done,” said Governor Brown. Read more here. Compared to other places, like Texas – known for its oil and gas production – California’s economy is performing better on most measures, showing that it is entirely possible to pair steep emission reductions with vibrant growth. California has established some of the world’s most ambitious carbon emission reduction targets, and is achieving them faster and at lower cost than expected. The state hit its 2020 target four years early, while its economy grew much faster any other state and the U.S. economy as a whole – California’s economy climbed from 10th largest in the world in 2012 to 5th largest today. As regional, state, city and business leaders head to San Francisco for the Global Climate Action Summit Wednesday, New York City and London are stepping up as urban leaders on climate change. The cities aren’t just issuing a single call—they are also working to coordinate the action it inspires. They will co-chair the Cities Divest/Invest forum as part of the C40 Climate Leadership Group, helping cities share divestment experiences and knowledge, and advocating for divestment from greenhouse gas-emitting fuels and investment in clean energy. This entry was posted in NewsBlog and tagged 100% renewable energy news, C40 Climate Leadership Group, California SB 100, economic benefits of climate action, Global Climate Action Summit, Solar Energy Industries Association (SEIA), Vote Solar on September 10, 2018 by Helen Deffenbacher.